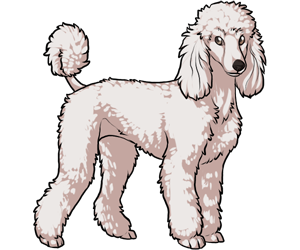 The Poodle originated in Germany in the 15th and 16th centuries as a water retriever. It is likely that the breed has origins in the French Water Dog, the Barbet, and the Hungarian Water Hound. The name "Poodle" is derived from the German word "pudel" which means "one who plays in water". The popular "poodle cut" was used by hunters to give the dog the maximum amount of mobility in the water, leaving hair to keep vital organs warm. The French used the breed as a circus performer due to it's extremely high intelligence and good nature. The breed was recognized by the AKC in 1887 and has been a favorite in the show ring since. The Poodle ranks number 2 in dog intelligence outranked only by the Border Collie. The Poodle is considered a more hypoallergenic dog than others because their shed hair gets caught in their curly fur instead of becoming airborn. The Standard Poodle came before the miniature and toy poodles. Poodles won the World Dog Show in 2007 and 2010.